While print book sales have been falling, the cookbook category has been growing. The economy is stagnant and more people are staying home and learning how to cook. In Healthy is Delicious: More Than a Cookbook, local author Kathleen Downey shares her recipes and knowledge for eating right and keeping sickness at bay. Downey, a Shamanic counselor and nutritional guide, shares her secrets for staying healthy after her experience curing her own Lyme disease and cancer over 20 years ago. She is also now free of arthritic pain and inflammation, two common side effects of Lyme disease. Downey describes her book as 50 percent about live food, and 50 percent cooked food, including fish, for omega oil support. She begins by reminding the reader how important water is in the daily routine, and discusses food combinations, as well as elimination. 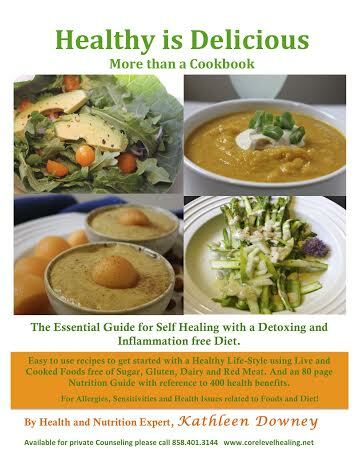 Living true to the subtitle “More Than a Cookbook,” Downey offers resources for detox retreats as well as a nutritional guide of 400 items and how each can help heal various conditions. While all of the recipes are free from processed sugar, dairy, gluten and red meat, she does emphasize that one size does not fit all, so each person should do what works for their own lifestyle. Healthy is Delicious can be purchased at CoreLevelHealing.net, Earth Foods in Holicong or Nurture Spa in New Hope. Downey can be reached at 858-401-3144 or CoreLevelHealing@gmail.com. May 2014. This entry was posted in DEPARTMENTS, Editorial and tagged audrey chen, cookbook, healthy is delicious, kathleen downey, local, review, the local bookcase by Healthy Living Bucks and Montgomery Counties. Bookmark the permalink.